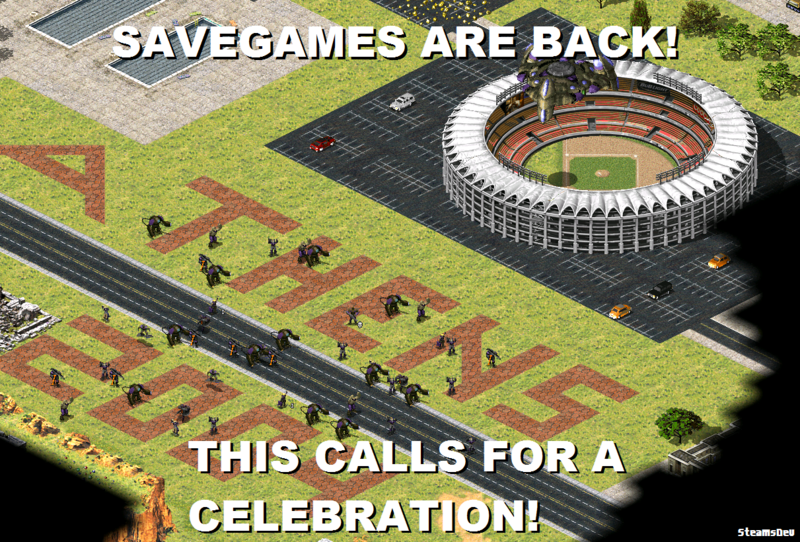 I'm proud to announce that Ares reached a milestone, 10 years after development started on the RockPatch successor: Savegames are officially supported again. Savegames were the last missing piece to finally leave the realms of 0.something version numbers, and today Ares 1.0 has been released officially. For your mods to properly support savegames, please see the Save Games topic in the documentation, in particular the part about the mod-specific information. It helps Ares to distinguish savegames of different versions of different mods. There aren't many notable new features or bugfixes to talk about (though the last weekend was still quite eventful with a newly discovered bug warranting a delay being reported just hours before the planned release), so I'll make it short. AlexB, my salvatorrrrrrrrr!!!!!!!!!! great guy! Thanks for your continuous work! It's amazing to see this one actually happen after all these years. Thanks AlexB, really awesome new for modding. @AlexB This didn't encourage me to make cool mental omega maps with triggers only, but also encouraged me to be closer to deathreaperz's two mods for more graphics, also for load/save/delete game. @deathreaperz I am going to be busy for now until late july this year, i need to find a way to contact with PiroPito in minecraft and niconico. Sweet sh*t my man, congratulations on the release. I bet that was a big one to get off your shoulders. Really great to see this come into fruition. Amazing Work as always AlexB. This filleth my heart with mirth.